Majestically perched high above the canyon floor, Druid Arch casts a haunting shadow over the needles of Canyonlands National Park. Rarely does a trail emit such powerful feelings of solitude, excitement, and adventure — like no human being has ever before traversed through this unique desert landscape. Soak it all in and appreciate the wildness of the route to the stunning Druid Arch. Hiking among the sharp pinnacles of rock to this uniquely archaic arch will transport you to a different world, one composed almost entirely of gorgeous red rocks and full of stunningly strange vistas. 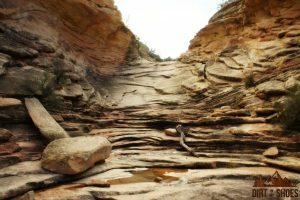 Trail conditions out here are primitive and water is often non-existent, so be prepared for a hiking adventure unlike any other! The trail begins at the Elephant Hill Trailhead and the access road to this area is dirt and extremely narrow with several blind curves. Don’t expect to get anywhere fast and be sure to be alert and attentive. 4-wheel drive is not required to reach the trailhead (we were in a small sedan) and the road conditions are generally fine. The parking area has a pit toilet and a few picnic tables but no water. From here, the road continues and is only for 4-wheel drive vehicles. Look for the trail sign to the left of the road heading up the hill to begin your hike. This “trail” is mainly travel over slickrock, meaning that often there is not a defined and obvious route. Much of the journey will require some route finding via cairns that have been strategically placed. It would be easy to get lost in the dark or if you are not paying attention to your surroundings. That being said, this was one of the most exciting and fun hikes I have ever done because of the element of adventure and exploration required to find the right way! You can hike as far as you’d like. We went all the way to Druid Arch but felt that the views were truly spectacular even from the very beginning of the trail. 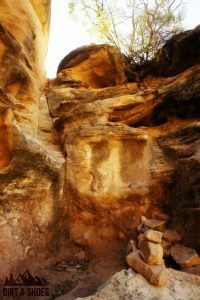 A short and narrow slot between two rocks is encountered about 1.5 miles into the hike and 2 miles in you will reach the wash that travels into Elephant Canyon or Chesler Park. Either of these places would be a great place to turn around for a short and enjoyable hike into The Needles. This trail begins with a gradual climb up the hill in front of you — don’t worry, you won’t gain much more elevation again until you are nearing Druid Arch. 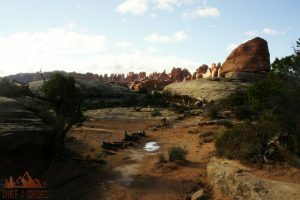 At the top of the hill, the view opens up to a gorgeous vista of the Needles and an enjoyable route over the slickrock. You may notice patches of weird dark soil as you hike along the trail. Take care not to step on it! 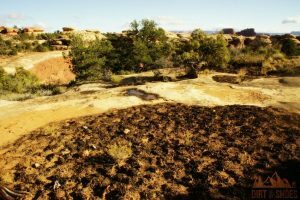 This is called a biological soil crust and is actually made up of many tiny living organisms (such as lichens, mosses, and bacteria) that are critical to the fragile desert environment of Canyonlands National Park. Far in the distance, look for the variance in the landscape. 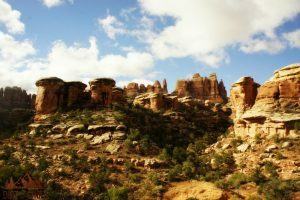 Because the rock formations in this area are so diverse, you may catch a glimpse of the gorgeous high cliffs in the Island in the Sky District of Canyonlands. About 1.5 miles into your hike, you will reach a trail junction. Look for the sign that points you in the direction of Druid Arch. 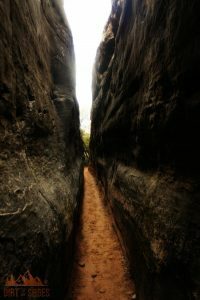 After hiking for a few more minutes, you will reach this short and narrow slot through two needle formations. It is a thrill trying to squeeze between the rocks along this section of the trail! 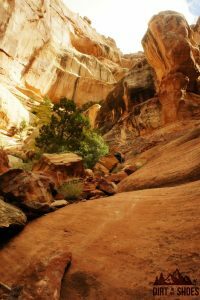 The views are phenomenal as you emerge from the slot and continue along the trail. Pinnacles of rock jut sharply out of the ground in every direction, with some of the most unique rock formations towering overhead. 2.1 miles into the hike, you will reach another junction. A sign marks the way, directing hikers who want to reach Druid Arch to turn left and head up the Elephant Canyon Wash. This wash is where the rainwater gathers and rushes out of the area, so you definitely don’t want to be hiking in here during a storm. 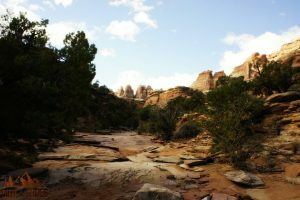 Expect some slogging through deep sand and loose rock for the reminder of your hike to the arch. It just adds to the adventure (but don’t expect to hike as fast as you normally do)! 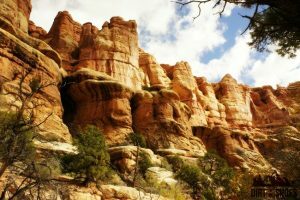 While you may get in the habit of looking at your feet while traversing through the wash, be sure to take some time to look up at the spectacular cathedrals of rock that surround you on all sides. I was in awe! After starting up the wash, look for trail junctions after 0.8 miles and then again after 0.5 miles. Because of all of the trail junctions and cairn following, bringing a map is critical to your safety and success on this hike. You can tell that you are nearing Druid Arch when the trail starts to get more exciting! We found a few adventurous climbs along our way and thoroughly enjoyed navigating through them. The first is a steep climb up this wall of rocks. A short distance later, we were met with this obstacle. Originally I thought that we must be on the wrong trail because there wasn’t a good way to avoid the water if you have short legs! But yes, this is the right way. And no, I didn’t get too wet. I stuck my trekking poles in the water and used them to balance me as I made my way up the rock. John didn’t have much of a problem getting up this one though. We were on this trail the day after a large rainstorm came through the area. 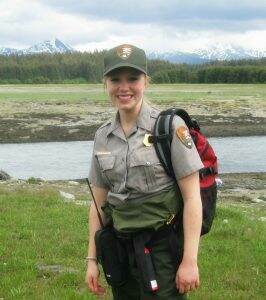 Don’t worry – we checked with the rangers at the Visitor Center to make sure it would be safe to hike. But that storm may have caused there to be more water in that pool than usual. Obstacle #3 is a terraced dryfall that is a little steep but has some good sturdy spots to use as hand and footholds. Just pretend that you are Indiana Jones and start climbing! The end is almost within your reach as you approach this ladder. In fact, straight ahead is the side profile of Druid Arch. 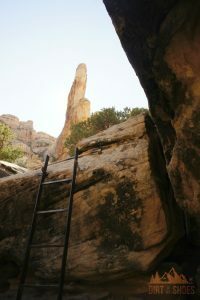 The ladder is firmly bolted into the rock, but the rock is a little slanted when you reach the top of the ladder so just take care while navigating across. Don’t you worry, more adventure awaits you before Druid Arch comes fully into view. Next is obstacle #5 – the scramble. I brought my trekking poles up this waterfall of rock but I wished I had left them down at the bottom. This section mostly consists of good climbing rocks to scramble up, but there are a few spots with no good handholds. Scrambling up rocks can be slightly time-consuming and exhausting, but overall it was very doable and didn’t take up too much time. When you are successfully worn out from the 5 obstacles I’ve outlined, nothing will energize and perk you right back up like finally reaching the breathtaking Druid Arch! WOW – it literally left me speechless! Seeing this arch in person was more incredible and rewarding than I ever could have imagined. The arch is gigantic, dramatic, stunning, and the best part……we had it all to ourselves! We stopped here, ate our lunch, and marveled at the sheer beauty that surrounded us (and all of the hard work that it took to get there). And you know what? I’m glad that the hike to Druid Arch is so long. I appreciated it more and definitely enjoyed my journey along one of the most fun and adventurous trails that I have ever done. 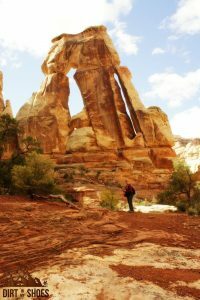 The hike to Druid Arch is 11 miles roundtrip. I would rate it moderately difficult because of the length, the route finding needed, and the obstacles encountered. If you haven’t had enough adventure for one day, get ready because now you have 5.5 exciting miles back to your car! From The Needles Visitor Center, travel about 3.5 miles toward the Squaw Flat Campground. Follow the signs to Elephant Hill and drive 3 miles along the dirt road to access the trailhead. Ash, I’ve been following your great advice and planning on a wonderful trip from TN. out west next spring ( I even Signed up with you) ! After the tremors recently I have been so concerned about the volcano erupting ! We had planned on taking our nine year old grand child with us for several weeks and had planned on it being THE TRIP OF OUR LIFETIME ! I really don’t know what to do ! The parks monitor activity very closely and try have an idea of when it would be too dangerous to be in the area. I would go ahead with your trip plans and have a great time!!! 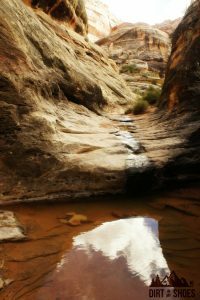 Hi- I will be heading out to Moab in a couple of weeks and have really enjoyed your blog. It’s beautiful and informative. However, I am confused about the distance from Moab to the Needles. How long does it actually take to get to the Needles District Visitors Center from Moab? Your site says 40 miles, but Google maps indicates its a 2 hour drive and the Fodor’s Travel book I have says its 80 from Moab! If you have more information on this, I would really appreciate it. Thanks! Thank you for pointing that out….I’ve fixed my typo to reflect the true distance from Moab to the Needles. You drive about 40 miles south of Moab to get to the turnoff to the Needles, and from there it’s another 35 miles or so. I would plan about 1.5 hours to reach the Needles Visitor Center if driving in from Moab! Hope that helps! Okay, I am just now coming to your blog for the first time in a while and I am OBSESSED with your new design!! Wow! It’s seriously gorgeous. Also, thanks for this post! 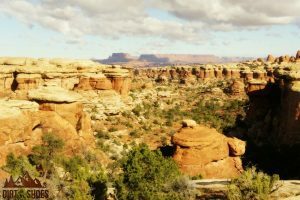 I am planning a Canyonlands trip for this year and I have no idea where to even start! Hey Shannon! I’m so glad that you like the new site…it was a lot of work but I’m happy with the way it turned out. 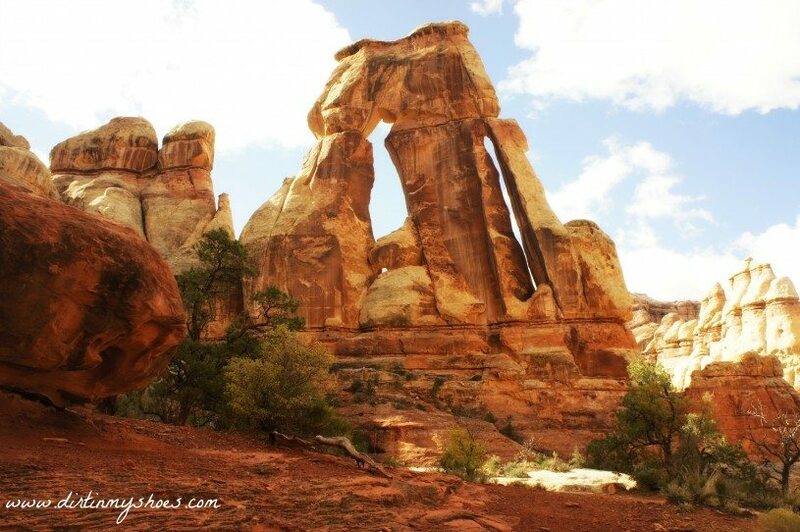 If you are going to Canyonlands, you definitely need to hike to Druid Arch. It was one of the coolest things I’ve done in a long time 🙂 Let me know if you have any questions about your trip! Oh man….hopefully the third time’s the charm?! I definitely was not expecting all of the climbing around and navigating through the obstacles. It makes the trail really fun but I’m sure the experience is different every time you go! May should be good — you’re gonna make it this time!